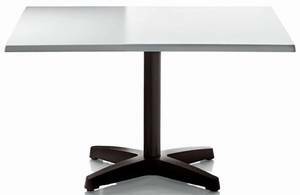 Description A dining/bar table suitable for use in many different environments. The top varies between 26mm and 35mm thick and is made from Werzalit, a hardwearing and weather-proof wood and resin compound. Available in white or patterned finishes. Steel tube stem and weighted polypropylene base both lacquered dark grey.